As expected, cleaning the car hasn’t been the most enjoyable part of the restoration, but after all, somebody has to do it. Glass abrasive appears to have caked itself over everything, even some areas that haven’t seen sunlight since the car was assembled back in ’69. Needless to say, it’s been tough work. In addition to the confounded glass, I had also neglected to scrape off the gummy adhesive that lines the windowsills and doorjambs when I removed the windshield and doors, so it was about time I tackled that task. Using a gasket scraper, I first removed all excess gunk on the car, before applying denatured alcohol to eliminate the residue it left behind. Since we’ll be painting the interior soon, I focused on the inside of the car, pulling all the remaining fiberglass insulation out of the roof as well as all the glass abrasive I could access. 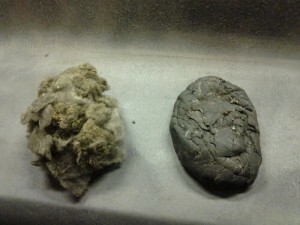 The fruit of my labor: two sizable globs of fiberglass and window goop. I’ve decided to leave the rear quarter panels alone. Should I, or any future owner down the line, decide to return the car to its original S-code specifications, re-replacing the panels to include the fake side scoops would be a significantly irksome task, considering it could have been avoided to begin with. 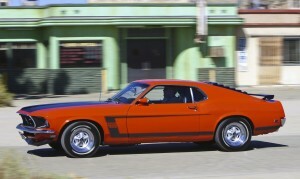 Finally, there’s also the financial matter: the car will never be more valuable as a Boss 302 clone than as an original ’69 S-code. The next few steps are to weld in the roll cage and sub-frame connectors, lead-in the left rear quarter panel seam, and have the underside, interior, and engine compartment painted. Looks like quite a bit of fun ahead of us yet! Well, Dad’s off to Europe. He and a few of his buddies decided the American auto scene didn’t offer enough panache, so they’ve been living it up at the Retromobile in Paris, France. Meanwhile, I’m stuck at home with a car to restore. In the past few days at the garage, I’ve finished grinding down the welds in the battery tray area, which is now looking good as new. When I wire up the car later, I may decide to move the battery to the trunk for a more balanced weight distribution, in which case there would be no need to actually weld a tray to the metal. Originally, the battery rested on a small platform to keep sulfuric acid off of the metal surfaces (and that worked just swell), but that was rusted through and cut out with the rest of the metal. 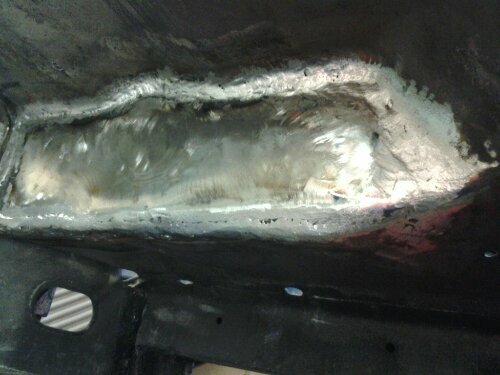 Next step is to go over every inch of the car and remove leftover glass abrasive and dust with an acid etching compound. As I clean up the car for final bodywork and paint prep, I’ll have to make some decision regarding the fake side-scoops in the rear quarter panels. 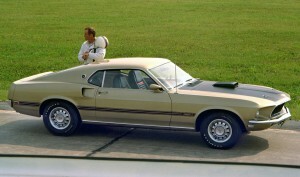 My original plan had been to cut them out and weld in new metal, in keeping with the design of the 1969 Boss 302 I’m replicated, but today Dan the Muffler Man pointed out that the scoops are actually quite desirable, and removing them would diminish the value of the car. Thoughts, anyone? OK--it's time to pick up the pace, Ace! You are currently browsing the Three Lions Garage archives for February, 2013. 48 mySQL queries in 0.175 seconds.